In this study, we investigated the influence of the distance between metal squares in self-complementary metal checkerboard patterns (CPs) on the transmittance characteristics in the infrared (IR) region. Transmittance characteristics of CPs in the IR region are rarely studied. Here, to clarify experimentally the influence of reactance variation in CPs on the transmittance in the IR region, we fabricated self-complementary metallic CPs with differing distances between the metal squares, and their transmittances were measured. Initially, two types of capacitive CPs (C-CPs) and three types of inductive CPs (I-CPs) were fabricated, and their IR transmittances were measured. The CPs were configured to have different gaps or overlapping distances between the metal squares for the C-CPs and I-CPs, respectively. Furthermore, we investigated the influence of the distance configuration of CPs consisting of both C-CPs and I-CPs, on the transmittances of x- and y-polarized incident IR electromagnetic waves. The evaluated hybrid CPs, referred to as anisotropic CPs (A-CPs), were fabricated with horizontal metal patterns in contact with each other and separated vertical components. The results demonstrated that the transmittance depends on sensitively to the gap or the overlapping distance between the metal squares of the self-complementary metallic CPs. Moreover, we observed remarkable changes in the transmittance associated with the A-CPs, resulting from the polarization of the incident IR electromagnetic waves. The authors would like to thank the Micro System Integration Center, Tohoku University for his support for a part of fabrication of checkerboard patterns. 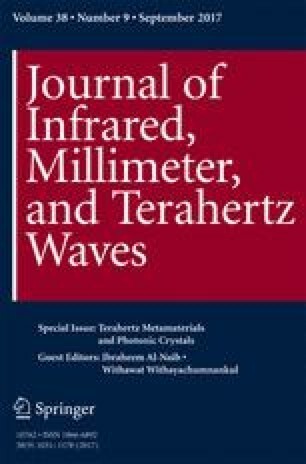 K. Takano, K. Shibuya, K. Akiyama, T. Nagashima, F. Miyamaru, and M. Hangyo, A metal-to-insulator transition in cut-wire-grid metamaterials in the terahertz region, Journal of Appl. Phys., vol. 107, no. 2, doi: 10.1063/1.3284958, 2010.